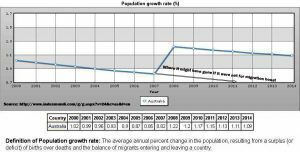 Is Australia facing a crisis of overpopulation and do we have enough resources to continue to expand our numbers by bringing in more immigrants into our country? Should we persist in growing our population, allowing immigration, consuming limited resources or close our borders, therefore, limiting population growth and over-consumption? Or is there something else at play of which we are not factoring? The Government and media often imply that increased population growth is needed to prop up growth in the economy. The premise is that economic demand is only sustainable in Australia through population growth. These adherents note that Australians are exhibiting a spiralling decline in fertility, and rising mortality and permanent departures from the country. They observe that the only reason our population grows at all is immigration. So despite our inherent xenophobia entering the public dialogue, immigration is still officially encouraged. 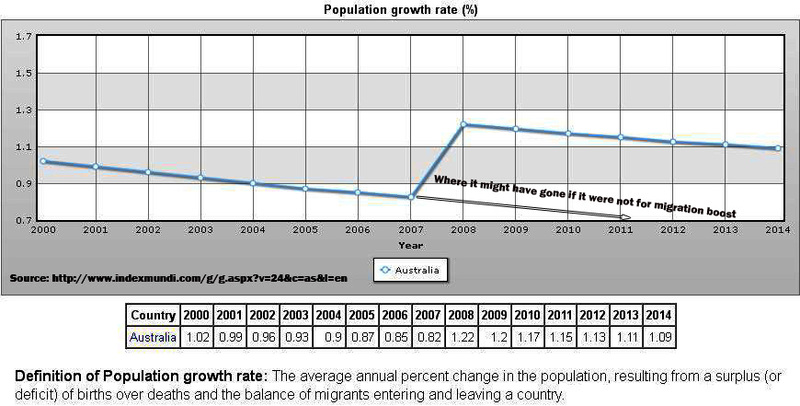 The slow total Australian population growth, courtesy of immigration, was evident in 19M in 2000 to 24M in 2016. Opponents to population growth, argue that the earth’s finite resources make it necessary to limit population growth. More radical opponents have gone as far to describe growth in population as an unsustainable “Ponzi scheme”. A Ponzi scheme is a fraudulent investment operation that pays a return to investors from new capital rather than from profit. In this case generating a new population of tax payers to support the earlier “investors” or older people. While a Ponzi scheme does not destroy anything, it does not create anything new either. Although it generates the illusion it does, eventually finite limitations prove it unsustainable, and it fails. The opponents of population growth in this country have suggested the population “Ponzi scheme” is failing and our economy is showing signs of it. They claim that the population Ponzi scheme is responsible for the failures in environmental, resourcing, consumption, borrowing, credit, homelessness, debt, food supply, health care, jobs, etc. While it is true Australia’s economic trajectory has shown a glut of economic indicators depicting downfalls in these areas, is the Ponzi scheme of population growth responsible? Is population the scapegoat that generates these downturns? Just which of these failures are the responsibility of this “scheme” or is the population Ponzi scheme argument a red herring stopping us from considering more relevant factors. We don’t need population growth to support a stronger taxation base to, in turn, support our ageing population. That we were not suffering from a skills shortage which could only be resolved through skilled immigration. Faith in human ingenuity is not sufficient to generate solutions to critical resource shortages. All well-supported arguments, but will a zero growth rate change these either way? Are these issues arising from population or policies of inequality? 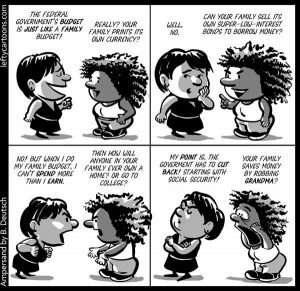 One of the inherent faulty assumptions behind the population Ponzi hypothesis is that all people are regarded as equal consumers. Our environmental impact and consumption is anything but equal. The Ponzi arguments often overlook the role of public policy decisions which are driving inequality. The following paragraphs will illustrate where these policies make a greater contribution to unsustainable consumption, ageing population support, unaffordable housing, transport congestion, job vacancy absences and risks of recession than population demographics. The SPA has mounted criticisms at Baby bonuses, child care rebates and family tax rebates because it presumes to promote population growth. Australia’s commitment to these policies has been half-hearted at best. The reality is these bonuses and rebates do not offset how expensive it is to bear children in this country. Australia’s has the world’s most expensive childcare and rising economic cost of children. So the SPA’s concerns are hyperbolic. Hence the Federal Government’s abolition of the Baby bonus among other spending cuts “reform” for families, reflects the real lack of commitment to supporting any population growth, despite their verbal claims to the contrary. Did anyone seriously imagine Peter Costello’s call to increase the birth rate with “One for Mum, one for Dad and one for the country” was a patriotic call that any family took seriously? Excuse me if I think any Treasure’s image or public “patriotic” call into the Australian bedrooms was anything of an incentive? Despite a blip in 2007/2008, our continuing experience has been the falling birth rates of the last few decades. There are a few grounds for concern here for the SPA, as the government’s efforts are lacklustre at best. On the other hand, the costs of immigration to bring in workers, to facilitate 457 visas, and even to pay them for working in our economy, is nowhere near as expensive as rearing children. Certainly, elements of corporate Australia would prefer to boost our population via this means, then use Australians, as foreigners can be bought cheaply. Abuse of visa workers is certainly not uncommon. So the question should be, is the need to boost the population to provide support for our economy, which or to facilitate exploitation and inequality? Transportation congestion while being an issue in Australia is a product of an ideology that favours roads over public transport. The ongoing failings of planning and the dubious justifications of WestConnex’s impact on the Sydney transport are illustrative of a political ideology that is rewarding corporate road builders who donate heavily to political parties, over and above developing good public transportation. Not so much a factor of the population but a failure of political impetus to build sustainable infrastructure that should have easily met our population growth. Government Debt is not in any manner like yours. Governments tend to favour population increases to spread the burden of public debt bond borrowings, raise revenue and stave off recession, presuming our population has the discretionary income to transact. The over-focusing on our tiny public debt (despite it growing from 10.1% to 18.3% of our GDP under the coalition), ignores the real recessionary pressures in Australia. These being credit growth and our unsustainable private debt at 123% of our GDP. While certainly a by-product of the population, perhaps we should focus on evidence-based conclusions for what debt levels we ought to be concerned about. Providing better regulation of banks to alleviate our society’s over-consumption of debt, serves Australian’s interests more than does current ideological policy. 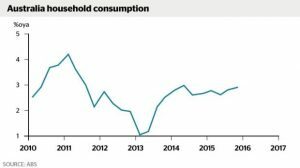 Erratic Household Consumption in Australia. 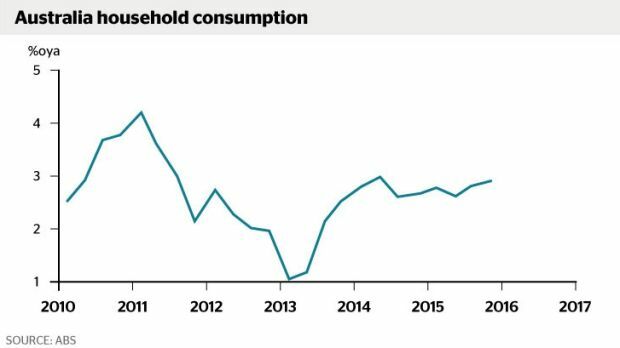 Australia has a high rate of consumption, but our household consumption is not rising at the same consistent or relative speed as the population in Australia. There are many inconsistencies generated in our entrenched poverty and social inequality in Australia. This makes the links presumed between consumption of housing and population tenuous, especially as the housing construction rate is exceeding demand needs. For example, Sydney is already a city of 90,000 unoccupied homes and Melbourne with 83,000 vacant residences. Blaming population for the risks of Recession and Housing booms/busts as suggested by Michael Janda’s ABC article ignores the effects of policies that support un-quarantined Negative Gearing Capital Gains concessions and facilitating Asian laundering of cash needs. Even where population contributes, inequality breeds erratic consumption levels and greed consumes far more than its fair share. 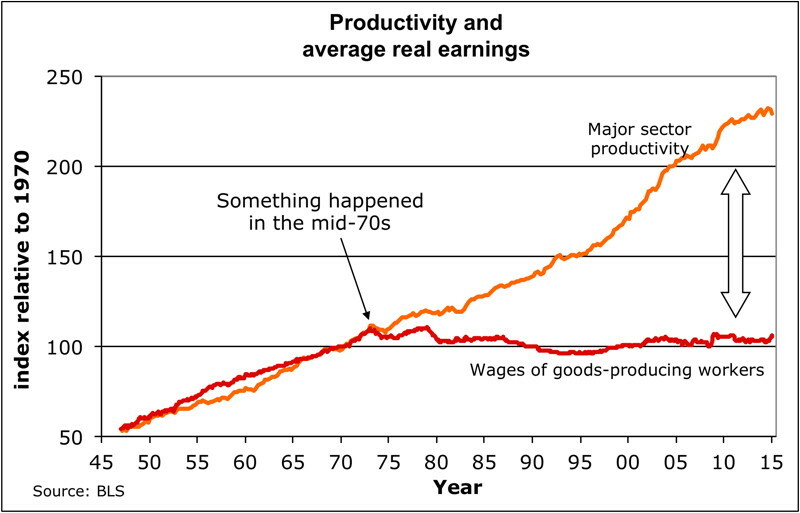 Technology is often considered labour-augmenting as it increases GDP without an accompanying growth in population. It might have been labour-augmenting in a pre-industrialised society but the onset of technological innovation is changing the playing field. Malcolm Turnbull’s “innovation nation” has an often unpredictable capacity to destroy jobs. The consequences of automation, is disappearing more jobs than outsourcing has ever done. 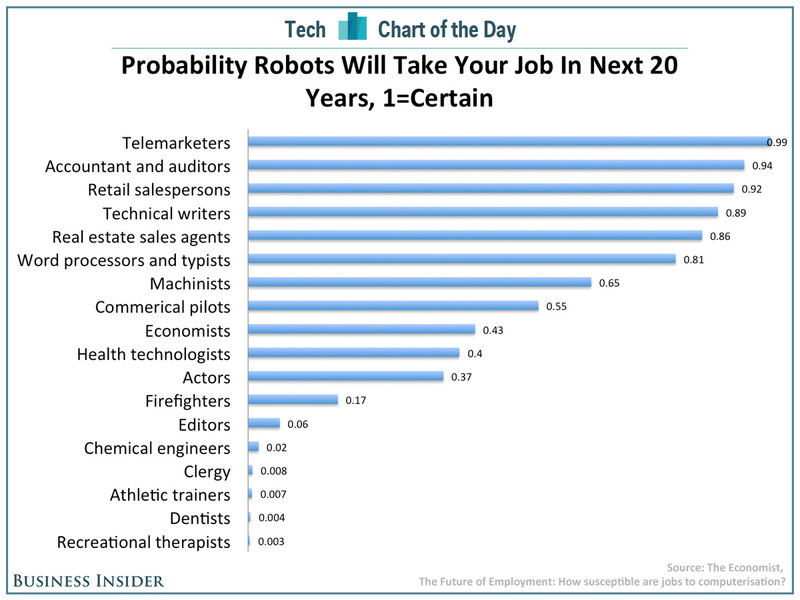 This is evident when we consider the MIT modelling on the relationship between machine learning/technology and job decline. 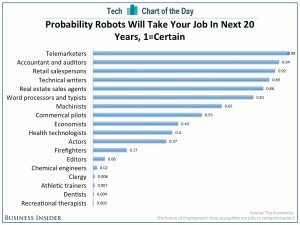 In fact, “Gartner Inc, the technology research firm, has predicted a third of all jobs will be lost to automation within a decade“. This technology overreach will create a shortfall in jobs often inaccurately attributed to over-population. Despite the productivity growth over the last couple of decades in Australia, it has not been accompanied by corresponding increases in jobs and wages earnings. Technology and falling remuneration’s impact suggest, paradoxically, that the human component (population) is becoming less relevant to the emerging economic, wealth generation structures. This has implications for the assumption that GDP growth is being fuelled by population growth. Demand and need, certainly continue to exist, and to grow with increasing population, but the relationship between economic and population growths is not proportional. For economic growth to be driven by demand then there must exist a capacity for supply to meet demand. But what if supply can not be paid for, because fewer individuals hold jobs? Full-time employment has slid 64K since December while part-time work has risen by 136K. Jobs earn income, and public services provision is dependent on adequate collection of income tax. Already 13.9% of Australians live below the poverty line (including 17.7% of all children). 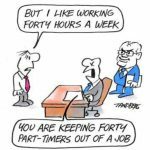 Full-time jobs are diminishing in preference to part-time positions and the top earners/corporations utilising tax avoidance means tax collection will only diminish. 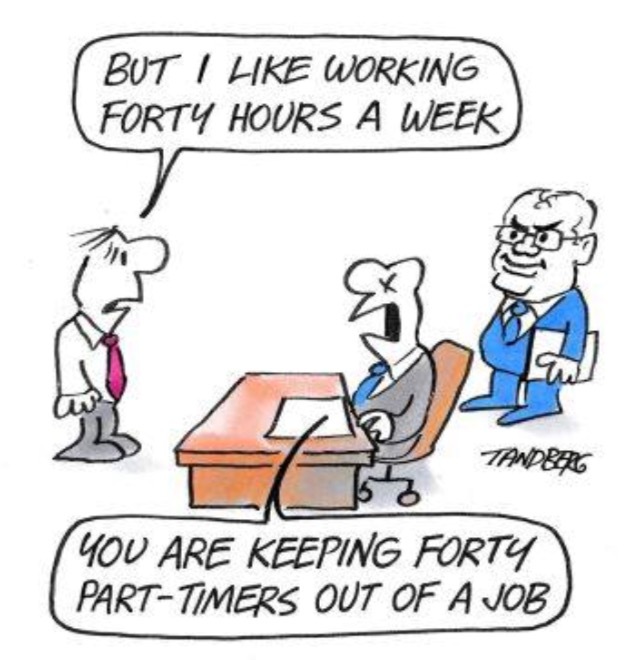 Internships providing unemployed labour for minimal costs favour corporations who already pay minimal tax. When population movement does not provide equitable changes in internal revenue collection for distribution into the economy then it can’t serve a population at any level. A rising life expectancy has contributed to an ageing population. The justification to pay for this through an increase in younger income earners ignores how increasingly more expensive over time children are to bear and rear. It also overlooks how the aged baby boomers actually contribute financially to the economy and the young (as even Mark O’Conner recognised). While the public purse is quite capable of supporting an ageing population, the lack of political will to do so impedes us. Solutions such as social cooperatives for aged care delivery, lifelong education, taxation on assets, corporations and superannuation are solutions we are unwilling to implement. In fact, the aged – well supported by the public purse – would result in greater spending inside our economy, in the same way as providing for the impoverished would. The ideological and political redirection generating vast inequality is more responsible for a deterioration in support for the aged, than population numbers and longer life expectancy. What of we who Survive? At the risk of pointing out the obvious, the ponzi accusation for Australia’s population is somewhat limited by our “surviving” population density. Australia outside of it’s capital cities has the smallest by a long shot. You probably don’t think that if you live in Sydney but then a fifth the population for our entire country lives there. Perhaps we can find a localised ponzi population effect in Sydney? Outside of our capitals you may have to move south to the Antarctica to beat Australia for a lower population density. Yes, it is a semi-desert continent and our capacity for rural production will be victim to climate change but again, the failures of government to support rural Australia should not be laid only at the door of population. So perhaps a country whose population is only .3% of the global population on 5% of the world’s land mass, the population is not the primary problem? The ponzi scheme that is failing, is not population, but the redistribution of per capita wealth. Given no appropriate investment in infrastructure for our population to generate jobs, create wealth and hence taxes, where lies revenue growth? Instead the government is desperately fighting a rear guard action by cutting services and talking of deficits limiting redistribution. Instead they speak erroneously of inter-generational debt and budget to commit $50 Billion to reduce company taxes. 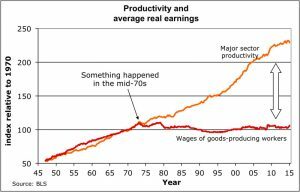 This economic insistence towards trickle down economics despite all the evidence of it not working to generate any significant economic growth. 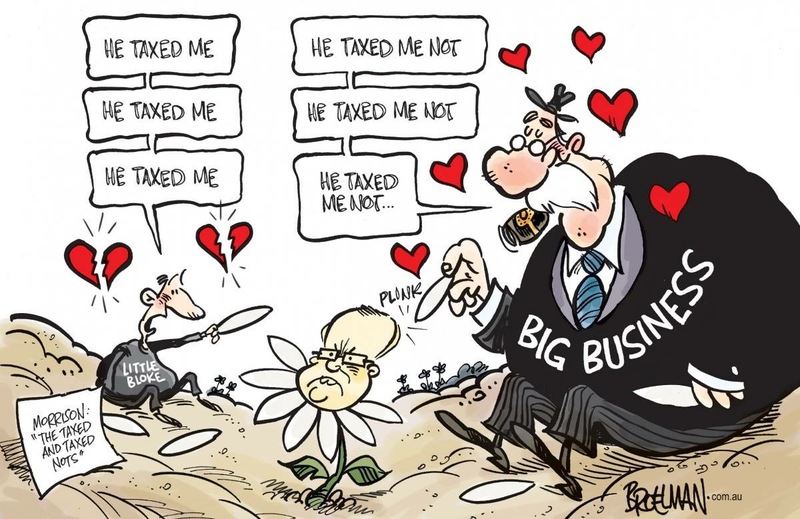 Morrison’s argument that Australia is being more divided into the taxed and untaxed is only relevant where he is talking about income taxes (which as Ross Gittons points out is “only a little over half the federal taxes we pay”). 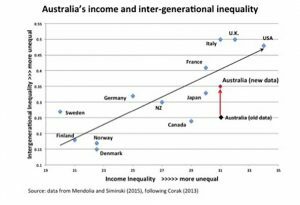 What Morrison fails to observe though, is the untaxed (from his limiting perspective of taxes) occur at both ends of the income spectrum. They that pay little or no Tax who farm their profits offshore to remove it from our economy and they who are increasingly impoverished (currently 2.5M live under the poverty line), who make too little to pay income tax! It is the diminishing middle class that have a larger tax burden (although small by international standards). Cutting taxes for the wealthy reduces their contribution to any redistribution of wealth via taxation. The unwillingness of the government to re-distribute income to that portion of the population that spends the majority of their income in the economy is counter-productive to our larger national wealth. These policies are merely provisioning for the inevitable revenue winter to come. Mark O’Conner while acknowledged these issues still berates political emphasis on wanting Australia’s small population base to continue to grow. They that call population growth a ponzi scheme often ignore the reality that the fallout of Australia’s “unsustainable population growth” is far more realistically expressed as unsustainable government ideology driving public policy. 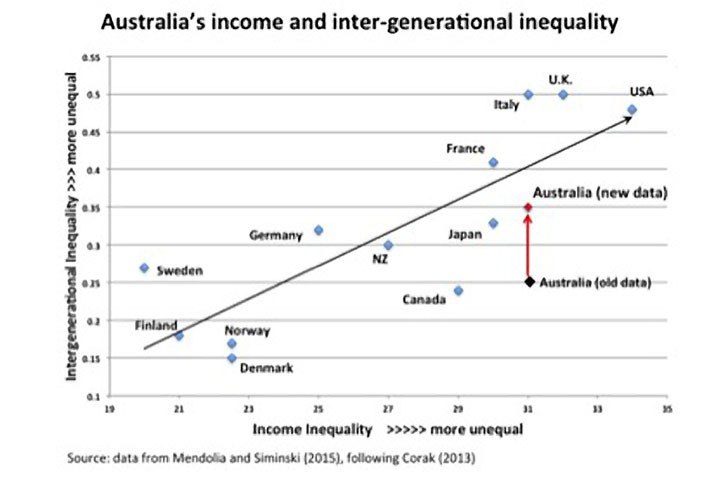 Zero population growth will alleviate none of these issues but changes in the ideological policy of inequality can reap benefits for all Australians. While excessive population growth is undesirable and may even be contributing, what effects it is having are masked by the more significant and destructive social and financial inequality. 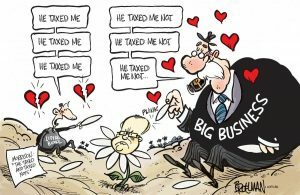 It is impossible to measure the effects of the ponzi population failure in Australia and know what is actually attributable to it when so much social damage is driven not by population but evidence-less ideologies and political corruption via lobbying and donations that drives our policy decisions. Coupled to corporate & political greed, the drivers for excessive private debt, a lack of infrastructure development resulting in job vacancy absences and concessional welfare for the wealthy and we have an economy risking a recession that no absence of population growth will correct.